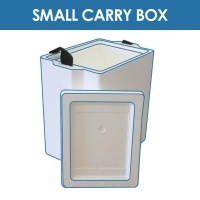 Our Carry Boxes offer a lightweight solution for your food transportation needs. Originally developed for the Meals on Wheels service , the Carry Boxes are also ideal for the hot and cold catering industry. From banquets to buffets, barbecues and family picnics. Whatever your needs the effective insulation of the Carry Boxes will help maintain a stable temperature while you transport your goods from A to B. The Carry Boxes have been designed with portability in mind and offer an efficient and cost-effective means of protecting food in transit while preserving temperatures. Moulded from high density 32 grams per litre Expanded Polystyrene, the specification for the best retention of heat. All Carry Boxes include a fitted lid and a black carry strap.